A few months ago, the Shimano camera I have facing forward on my bike fell off. The clip isn’t all that great, and I apparently hadn’t secured it properly. After pinging across the road, it still worked – but the lens was cracked. A new lens cost $40, so I didn’t buy one; after all the camera came with a spare one (of a different shape for using under water) which I thought would be fine. Except that I couldn’t find it anywhere. And then it seems what remaining stocks of spare lenses that might have been around evaporated, and were no longer available anywhere. 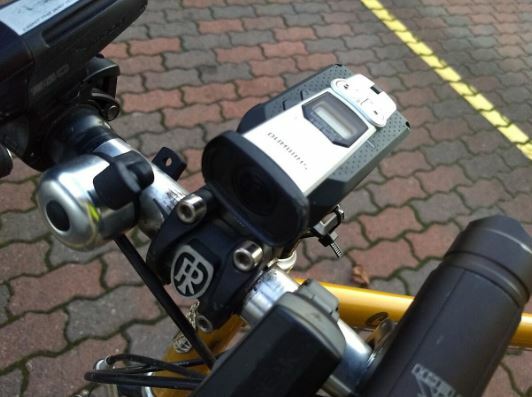 The great thing about Shimano bike cameras though is that they are absolutely awful. Not the actual camera bit; the physical design (apart perhaps for the clip) and the video quality is fine. No, rather all the other bits are awful. They WiFi connection is flaky as. The battery life is ordinary. The app is a disaster. The promised video editing software to overlay your data has never made an appearance. This means that, when launched, they retail at $500 but after a while are available for a song as no-one wants to buy them. And it seems Shimano made a version 2 bike cam, and this too is awful, and is now also available for a song. A $149 song, in fact – which is not a bad price for a high-quality HD waterproof camera, even if none of the other features work. So I bought one. Although they still don’t include a handlebar mount, I was able it improvise a stem mount from the helmet mount and some cable ties.